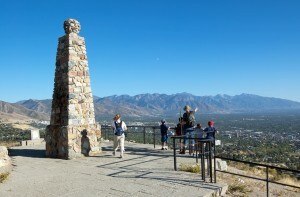 Ensign Peak. Photo by Kenneth Mays. In 1934, an 18-foot monument was placed there by the Salt Lake Ensign Stake Mutual Improvement Associations.4 The monument is comprised of stones collected from stakes along the Mormon Trail.5 The inscriptions of the names of some stakes are still visible today. On July 26, 1996, President Gordon B. Hinckley dedicated the Ensign Peak Nature Park which included Ensign Peak and an additional 66 acres surrounding it. 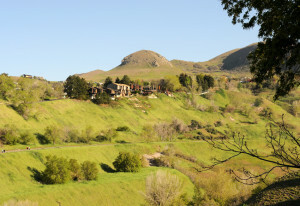 President Hinckley dedicated it that it may “be a place of pondering, a place of remembrance, a place of thoughtful gratitude, a place of purposeful resolution.”6 The effort was headed by the Ensign Peak Foundation later known as the Mormon Historic Sites Foundation, who worked closely with the Salt Lake City Corporation. 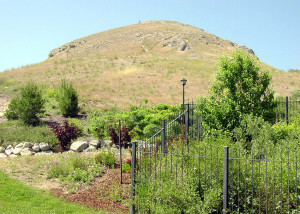 The Church of Jesus Christ of Latter-day Saints also constructed a memorial garden near the base of the peak which tells of the peaks’ significance and the early pioneers who built up the Salt Lake Valley. 1 Contributor, Volume 1, No. 11, (August 1880), 253. 2 George Albert Smith, Conference Report, (April 1927), 85 – 86. 3 Brigham H. Roberts, Conference Report, (April 1915), 130. 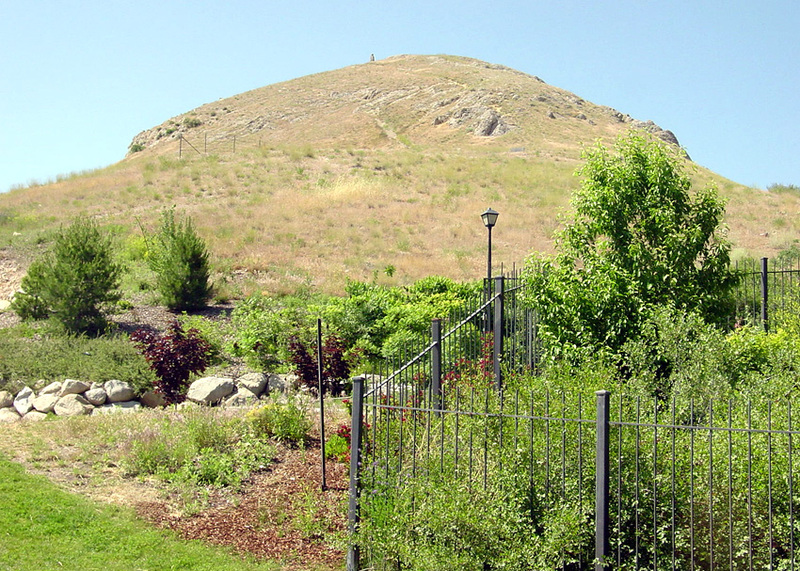 4 “Ensign Peak-Utah’s Own Mount Sinai,” LDS Church News, July 20, 1991. 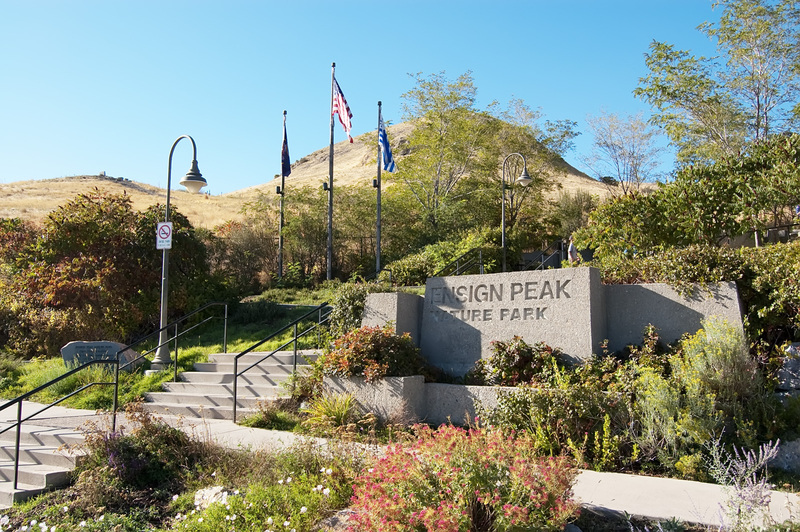 6 “Park at Ensign Peak Dedicated,” LDS Church News, August 3, 1996. Source(s): Journal of Discourses, 26 vols. [London: Latter-day Saints’ Book Depot, 1854-1886], 13: 86. B. H. Roberts, “The ‘Mormons’ and the United States Flag,” Improvement Era, November 1921. D. Michael Quinn, “The Flag of the Kingdom of God,” BYU Studies, 1973. 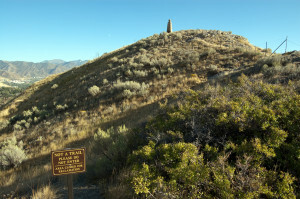 Ronald W. Walker, “‘A Banner is Unfurled’: Mormonism’s Ensign Peak,” Dialogue, 1993. 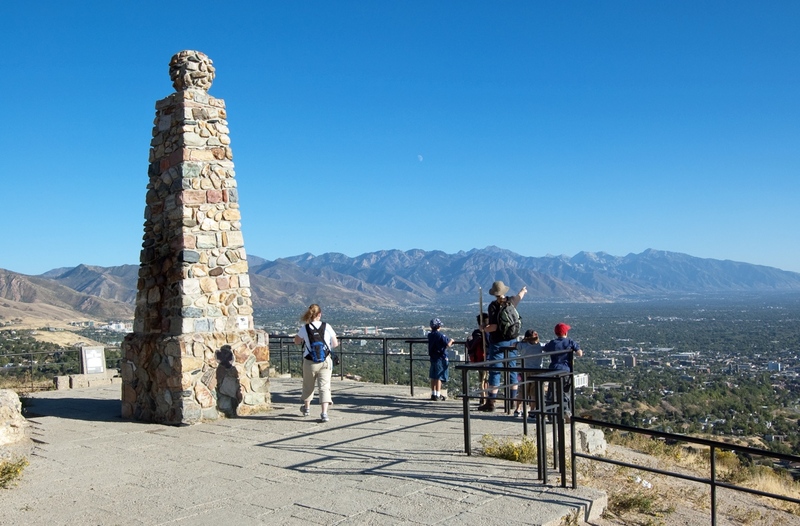 Ronald W. Walker, “A Gauge of the Times: Ensign Peak in the Twentieth Century,” Utah Historical Quarterly, 1994. 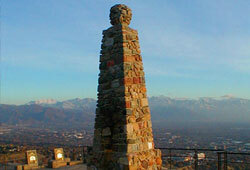 Ronald W. Walker, “Historic Ensign Peak,” Pioneer, 1995.